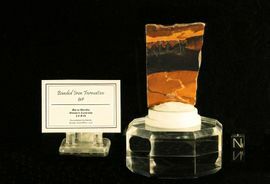 The fascinating biochemical origin of Banded Iron Formation rocks make them important specimens in serious geological collections. In earth's early history the young oceans contained reduced iron that had been washed into them over time from continents. This iron combined with the nascent oxygen produced by photosynthetic bacteria then settled on the ocean floors. The bacterial cycle of growth - bloom and then bust - of seasonal feedback oscillations in the oceans formed a complex feedback loop of unique geological layering, now known as banded iron formations. 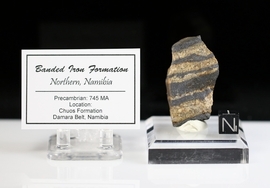 Banded Iron Chuos Formation Northern Namibia Africa - Sold!